His funeral was held in St Mary's Church, Wivenhoe on 16th April 1926 and was attended by many people including a number of local dignatories. McEvers Bayard Brown was an eccentric millionaire from the USA who arrived in the River Colne on his yacht the Valfreyia in 1898 who liked the River Colne so much he stayed here until his death in April 1926. 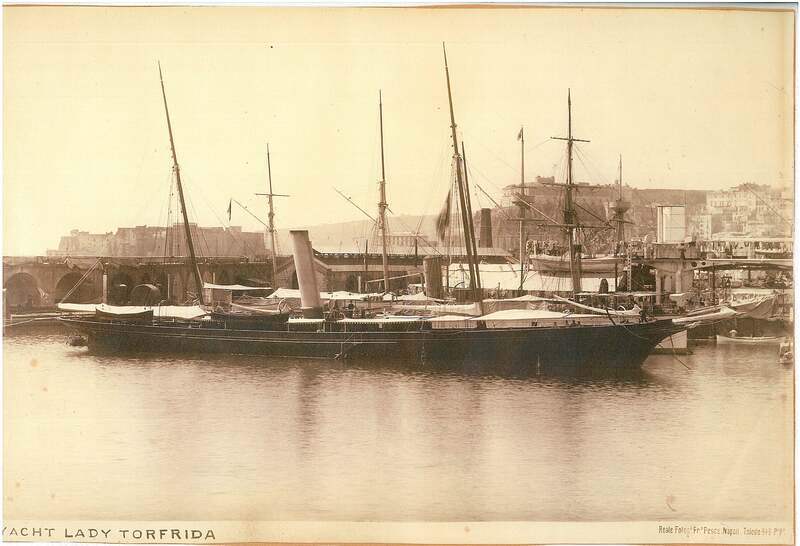 The Valfreyia was first moored with other similar boats just downstream of Wivenhoe and then, later and for several years, in the dry dock of the upstream shipyard which was then managed by Rennie Ritchie & Newport and then taken over by Otto Andersen in 1925. 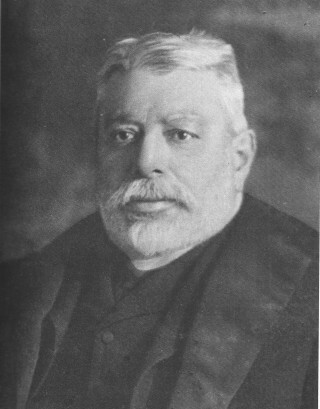 Bayard Brown was known as a generous man although with some eccentric habits. Click here for more detailed account of Bayard Brown and his yacht Valfreyia. plus the following current and old members of the crew: Messrs: Harry Cole, Fred Brown, Charles Sainty, O. Goodwin, A Lilley, W Seeley and fireman W. Cole. They were joined by an old servant of Bayard Brown, Mr F. Wilkin. In the crowded congregation were a number of distinguished people including: Dame Catherine Hunt (Deputy Mayor of Colchester); Mr H.C. Wanklyn (Colchester Borough Town Clerk) representing the Mayor of Colchester, Cllr A. Piper, who was unavoidably absent; Alderman Wilson Marriage (Portreeve); Messrs H.Hook (Chairman) H.Seymour, G.Hillyard, and A.J.B.Tapling, all members of Wivenhoe Urban District Council; and a great many others. The memorial service was held on Friday afternoon, 16th April 1926. Despite the fact the afternoon was wet and stormy, according to the Colchester Gazette, a considerable crowd lined the High Street. Blinds at local business houses were drawn, the flag over the Church floated at half mast and a muffled peal was rung on the Church bells. A crowd had also gathered round the yacht where, it had been stated, the millionaire lay in a magnificent and elaborate coffin with a plate glass front. This was not the case however. Apparently, since the body had been embalmed it had reposed in a temporary coffin covered with a purple cloth, and it was not until it had been received in London that it was transferred to the more magnificent receptable previously referred to. In its temporary resting place on the yacht, watched over by the crew and many old friends, it was reported that they had been much gratified to see that the face of Mr Bayard Brown still retained its gentle smile. When the coffin left the yacht, it was almost hidden in the folds of the ‘Stars and Stripes’ of America. On top of this rested a few floral tributes. For the first time, the yacht was left unguarded to enable every member of the crew to attend the memorial service. The coffin was met at the entrance of St Mary’s Church by the Vicar of Brightlingsea, the Rev R.F. Rendall and the Rev G.C.M. Hall, Rector of Southery in Norfolk but previously the Curate of Brightlingsea. The Churchwardens were Messrs H. Hook and J.G. Moore, and Mr W.H. Warburton, Churchwarden at Brightlingsea. In the procession behind the coffin were Mr P.J. Rutland of Messrs Rutland and Crawford, solicitors in London; Major Sturdee, cousin of Admiral Sir Doveton Sturdee and secretary to Mr Bayard Brown; Mr J.A Willmott, Mr Gordon Pratt and Mr W.H. 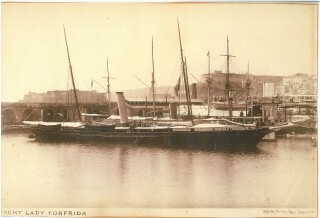 Fieldgate, son of the late Captain Fieldgate, who had been Captain of the Valfreyia for over 30 years; Dr Heaton (medical adviser) and then the crew including former members of it. The Colchester Gazette reported that Master Jack Glozier, who was aged just 14 years, played Mendelssohn’s ‘O rest in the Lord’ as the cortège filed into Church. There were two hymns ‘Jesus Calls Us’ and ‘On the Resurrection Morning’. After the service, when the procession passed outside into a steady downpour of rain, the organist played the ‘Dead March in Saul’, followed by Handel’s Largo. The coffin was placed on a motor hearse, which proceeded slowly out of Wivenhoe before speeding to the mortuary of the undertakers at Earls Court, London. It was here that the body was transferred to another coffin, the shell of which was made of copper and lined with satin and silk, it had a plate glass front and the cask was made from mahogany. 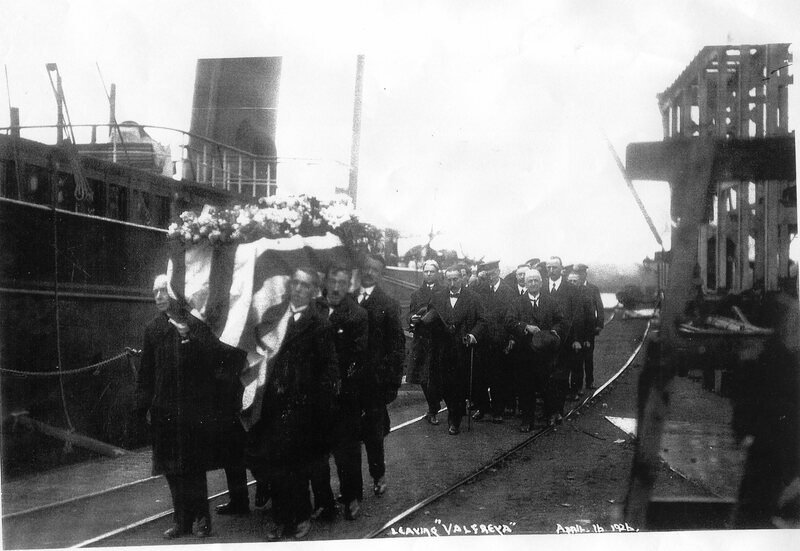 This was all shipped at Southampton by the Hamburg-America Line for interment at Brooklyn New York a week later on Saturday 24th April, 1926. This page was added on 19/09/2016.